The RIO Adventure™ RA-CK500 cookhouse features a lightweight aluminum frame and gray melamine counter top, heat-resistant up to 425°. 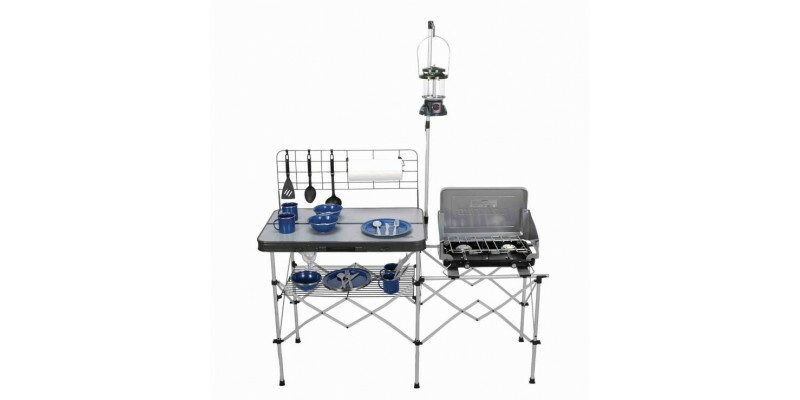 Includes steel grate back rack plus hooks for hanging paper towels and utensils. Also includes steel grate bottom rack for storage or drying dishes, side stove table and a lantern pole. Folds flat for easy storage and transport. Includes integrated carry handle. Counter height is 32”. Weighs 17 lbs. Supports up to 60 lbs. Ideal for camping, RV’ing and tailgating. Measures 56.7” x 21.1” x 71.7” when set up (including lantern pole). Folds to 32” x 11” x 4”.